Wow, where has the summer gone? Can you believe that 14 of the 17 Mass Bay Season Championship qualifiers have been sailed and scored?? That means there are just three races left to the season, and much like last year, almost all of the final places in all of the classes are still up for grabs! In the Jib & Main Division, in Fleet G, Tom Anderson's Nonpareil has a very solid lead with six races sailed and 530.7 points but Karen Peake in Alegria is just a couple of bullets away from challenging for first place overall. Falcon, Andiamo, Truant and Facet are just a race away from getting their fourth qualifier in and making the podium. For Fleet F, it is the battle of the "A” boats, as Ares is clinging to a slight lead over Ariel and Atlantea for first place overall, with Jody Graul in Summerin’ ready to get into the mix with another couple of strong finishes. 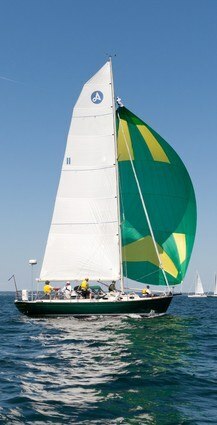 Moving on to the Spinnaker Division, last year’s Fleet D winner, Steve Cavanaugh and his Thunderbird Mysterious Ways is in first place and in the driver’s seat; Dea Salacia and Atalanta could be in the mix with a couple of solid finishes in the last three races. Fleet C looks like it is going to be a battle to the end between our 2007 Rookie of the Year, Lance Ryley in Rocket trying to fend off our 2006 Rookie of the Year RJ DiMattia for the top spot, with the South Shore boats Moose and Static trying to get the final spot on the podium. With only 50 points separating the top three boats in Fleet B, everything is wide open, and a late-charging Indra with three races to go will be in the mix as well. In Fleet A, perennial favorite Katabatic has a solid grip on First place with Scheherazade and Langosta battling it out for a podium finish. And let’s not forget about the Pursuit Race Championship as well. Seven of the eight races are in the books, with only the Boston Harbor Islands Regatta left to run on Saturday, September 28. In the Jib & Main Division, Tom Anderson’s Nonpariel has racked up quite a lead, but depending upon the number of entries in the Boston Harbor Islands Regatta that could all change. And in the Spinnaker division, Superstition and Sparkle Pony are tied with 81 points, with Superstition only in first place because of the tie-breaker. Averisera, Vanish, Agora, Langosta and Vida Zee are all within striking distance to take over the lead, so it is going to be a VERY exciting finish to the season. So, if you have not entered either the Hingham Bay PHRF Chowder Cup on the South Shore on Saturday, September 21st, or either the Manchester Fall Series on Sunday September 22 of the Marblehead Chowder Cup on Sunday, September 29th on the North Shore, head on over to www.regattaman.com and sign up today! !